The Lady in the Van, Alan Bennett’s adaptation of his commercial and critical West End hit, based on his own bestselling memoir will open in New York & Los Angeles for a Limited Engagement on December 4, 2015. 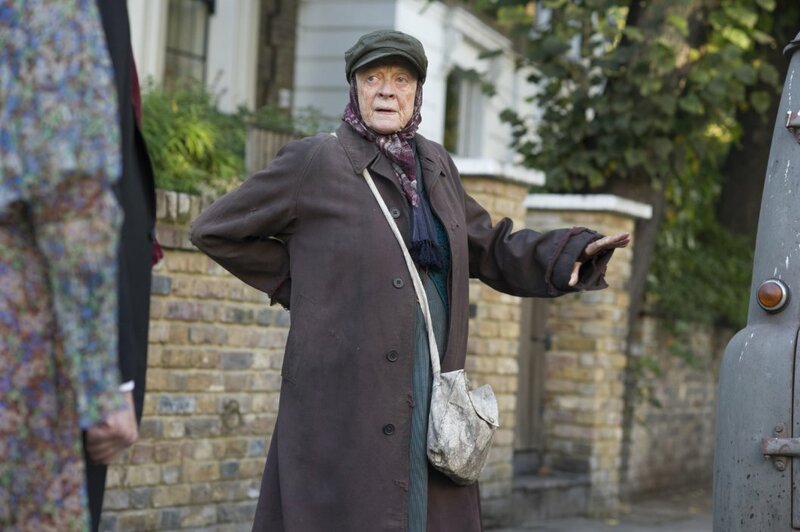 Dame Maggie Smith reprises one of her most-loved stage roles for the big screen, under the direction of Nicholas Hytner, who also directed the stage version. Damian Jones and Kevin Loader produced, along with Hytner. 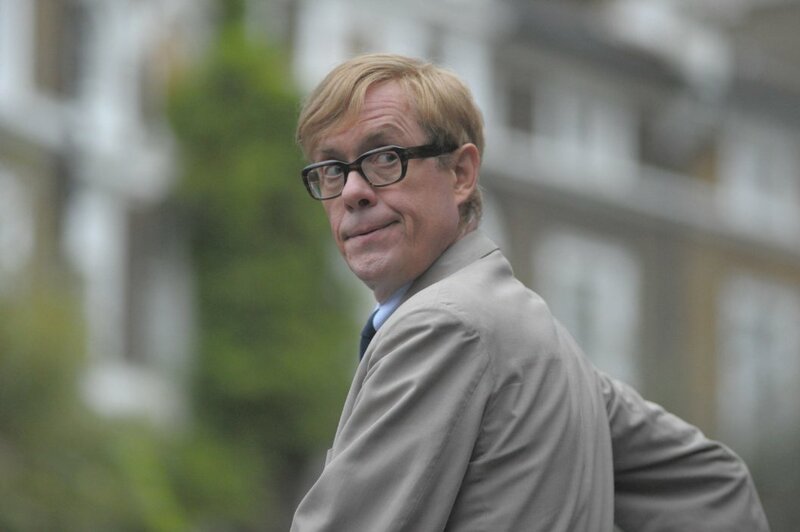 The film tells the true story of Alan Bennett’s strained friendship with Miss Mary Shepherd, an eccentric woman of uncertain origins, who “temporarily” parked her broken down van in Bennett’s London driveway… and proceeded to live there for the next fifteen years. Their unique story is funny, poignant and life-affirming. Miss Smith, who plays the singular Miss Shepherd, is joined by Alex Jennings (The Queen), who plays Bennett. Smith incarnation of Shepard is nothing but her usual brilliance. She is quirky and earnest. We are treated to a true character study in her subtle facial expressions and physicality. Each beat is masterful in comic timing. Jennings, as Bennett, is equally as charming in his quiet insolence. As Miss Shepard’s inevitable enabler, their relationship is actually a foil for Bennett’s real life lack of a relationship with his own mother. Bennett as narrator of his own tale, has the opportunity to play two very distinct sides of his personality. The performance should not go unnoticed come awards season. Others in the cast include Frances de la Tour, Roger Allam, Dominic Cooper, Jim Broadbent & James Corden. The script has a lovely Odd Couple feel to it. 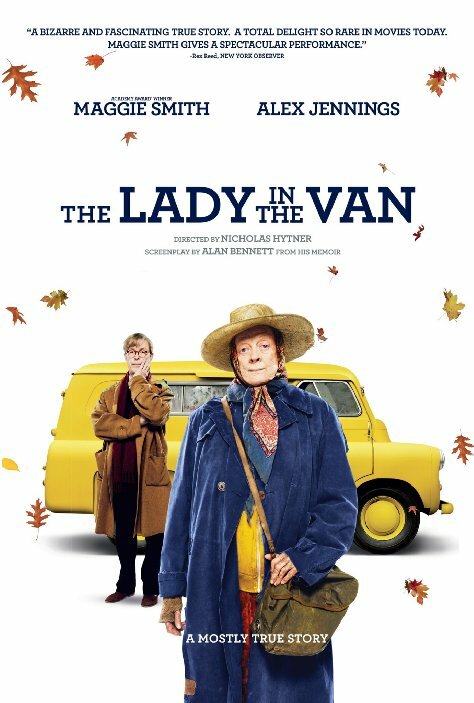 Filed with heart, emotional pull, mystery and levity, The Lady in the Van, (however much based on true events) will capture your soul. With a cast such as this, under the delightful direction of Nicholas Hytner, one cannot go wrong. 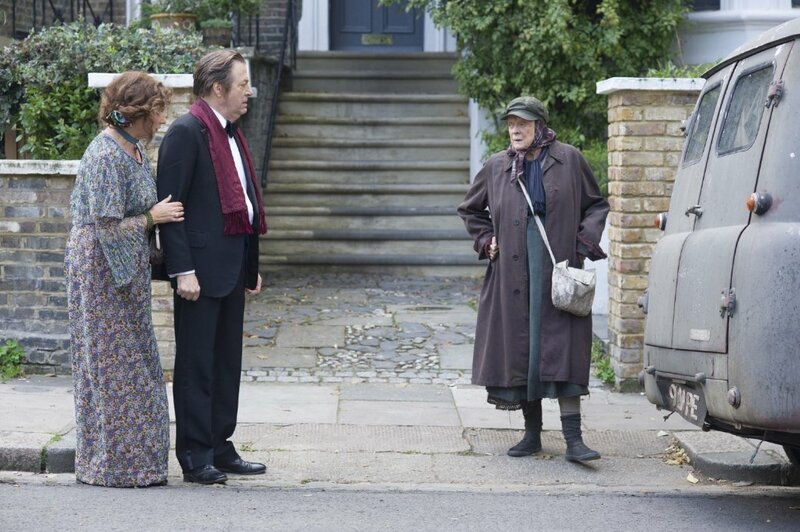 THE LADY IN THE VAN runs 103 Minutes. The film is Hytner’s first directorial outing after ending his massively successful decade at the head of the British National Theatre. He and Bennett previously collaborated on The Madness of King George and The History Boys. 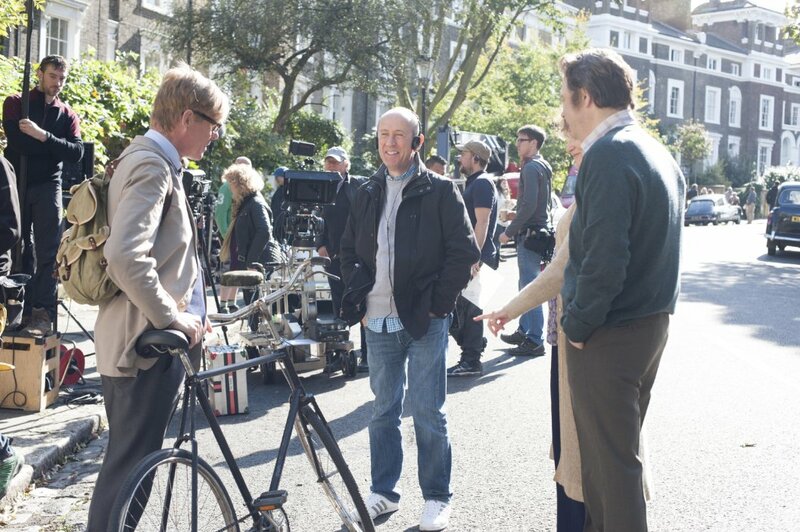 Damian Jones (The Iron Lady, Belle) and Kevin Loader (Venus, In the Loop) produced, along with Hytner. Hytner is among the preeminent theatrical creators of his generation, having directed such standouts as Miss Saigon, Stuff Happens, and One Man, Two Guvnors. At the National, he commissioned the breakout hits Warhorse, The Curious Case of the Dog in the Night, Jerry Springer, The Opera and Danny Boyle’s Frankenstein. In addition to Madness and History Boys, his filmography also includes Wendy Wasserstein’s The Object of My Affection and Arthur Miller’s The Crucible, starring Daniel Day-Lewis. He has won multiple Olivier and Tony Awards, and a BAFTA. Dame Maggie Smith has led a distinguished, varied career on stage, in film and in television over the past six decades. She is a two-time Academy Award® winner (The Prime of Miss Jean Brodie, California Suite) and has been nominated an additional four times. Among many other accolades and honors, she has won multiple BAFTA Awards, Emmy Awards and a Tony. Her achievements range from performing Shakespeare opposite Laurence Olivier, to capturing the attention of a new generation when she played the strict witchcraft teacher Minerva McGonagall in the Harry Potter films, and recently as the Dowager Countess of Grantham, in the acclaimed television drama Downton Abbey. Alex Jennings is one of the most successful British actors of his generation. He has played Alan Bennett multiple times and is currently shooting the Netflix series “The Crown” where he portrays the Duke of Windsor. Bennett, a celebrated playwright, screenwriter, actor and author, is considered a national literary treasure in England. Over the course of his more than 50-year career, he has won, or been nominated for, every major writing award that exists in film, television and theatre, including an Academy Award®, multiple BAFTAs, Tonys, and Oliviers. This entry was posted in First Look, Go To The Movies, in theaters, Liz, New York City, News, Page to Screen, Poster, Release, Reviews, Trailer, What To Watch This Week, Woman Lead, Women in Film and tagged Alan Bennett, Alex Jennings, Dame Maggie Smith, December release, Dominic, Frances de la Tour, James Corden, January release, jim broadbent, Miss Shepard, mostly true, Nicholas Hytner, Odd Couple, release dates, Review, Roger Allam, role reprisal, stage to screen, The Lady in the Van, trailer by Liz Whittemore. Bookmark the permalink.